Characteristics of a route can be represented as a point event located using an offset distance from an existing point feature. The reference offset data is translated to routes and measures for storage. As shown in the example below, imagine a route with From and To measure values of 0 and 12 miles, respectively. The Measure of the event is located at a distance of 6 miles to the right of the existing point feature. If the calibration direction of the route was from right to left, the offset distance would have been calculated in the reverse direction (from left to right). In that case, the offset distance would have been shown with a negative number. In the Edit Events group, click the Point Events button . The Add Point Events dialog box appears. The dialog box is unavailable when there are no editable point event layers in the map. Click the Event Layer drop-down arrow and choose an event layer to edit. 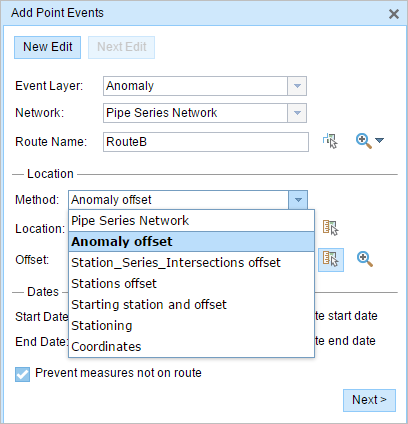 In the Location section, click the Method drop-down arrow and click Anomaly offset (Point Event layer name with offset suffix). All the point event layers that are published with the map service and are registered with the chosen network appear in the drop-down list. Click the Network drop-down arrow and choose the network that will serve as a source for providing the measure for the new event. The widget accepts an LRS Network as a source to identify the location for adding the new point event. However, when the new point event data is being stored in the database, the application performs an internal translation of measures to always store the measure value in the linear referencing method of the LRS Network with which the event is registered. The Network value can be a published LRS Network layer. Type a route name in the Route Name text box. Click the Select a Route on the Map tool and select the route from the map. The selected route is highlighted on the map. Click the Direction drop-down arrow and choose the direction of the offset, type the offset value, and choose the units. Type the offset value and choose the units. A red cross is placed at the offset location along the route on the map. This is the location of the Measure value for the event. This value denotes the distance between the chosen point event and the proposed Measure on the selected route. The offset direction is optional. If no direction is specified, a positive offset value will place the Measure location along the direction of calibration from the selected point feature, and a negative offset value will place the Measure location opposite the direction of calibration from the selected point feature. The new event will be associated with the route (route name) from the LRS Network that the event location intersects. In cases where the input location intersection may have more than one route in the registered LRS Network (overlapping routes), a dialog box prompts you to choose the route with which you prefer the event to be associated. If you type the Measure value, you can choose the unit for that value using the drop-down arrow. The Measure value will be converted into the LRS units before saving the newly added events. For example, the LRS is in miles and you have entered 528 feet as the Measure value. The newly added events will have a Measure value of 0.1 miles because 528 feet equals 0.1 miles. Check the Use route start date check box. 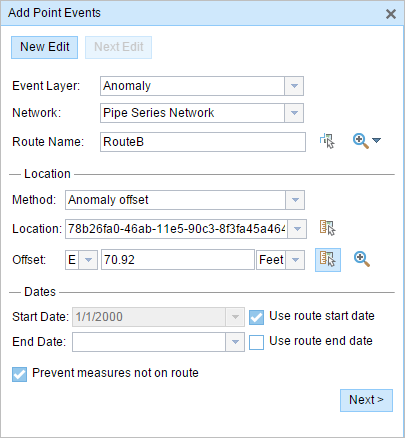 If you configured your instance of Event Editor to not allow dates prior to the start date of the route, and you enter a date prior to the start date of the selected route in Start Date, a warning message appears alerting you to choose a date on or after the start date of the selected route. Check the Use route end date check box. The Prevent measures not on route check box is checked by default. Prevent measures not on route—This data validation option ensures that the input measure values for the From measure and To measure values fall within the minimum and maximum range of measure values on the selected route. Click Next to view the Attribute-Value table. This table contains all the attributes of the event layer. Fill in all the attribute information for the new event in this table. 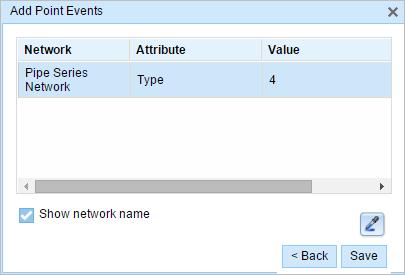 Check the Show network name check box to see the LRS Network with which the selected event layer is associated. A confirmation message appears at the lower right once the newly added point event is saved. The new point is created and appears on the map.